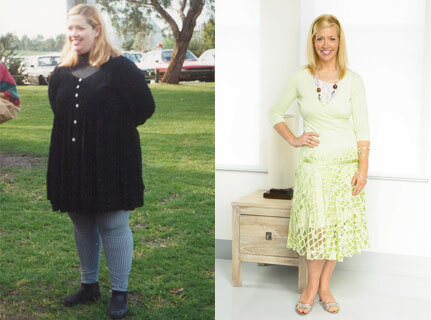 This ancient Chinese healing technique, despite being around for centuries, is one of the latest shiny new trends to hit the western beauty and wellness industry, in amongst many other alternative, holistic and Traditional Chinese Medicine therapies to gain renewed popularity in recent times. It also has roots in Vietnamese culture, where it is referred to as Cao Gio. To those who have never seen or used Gua Sha before, it involves firm stroking or scraping of the skin using a blunt, flat stone tool, often rose quartz or jade, across the face and body in an effort to stimulate circulation, promote desquamation, remove toxins, and relieve muscle tension. 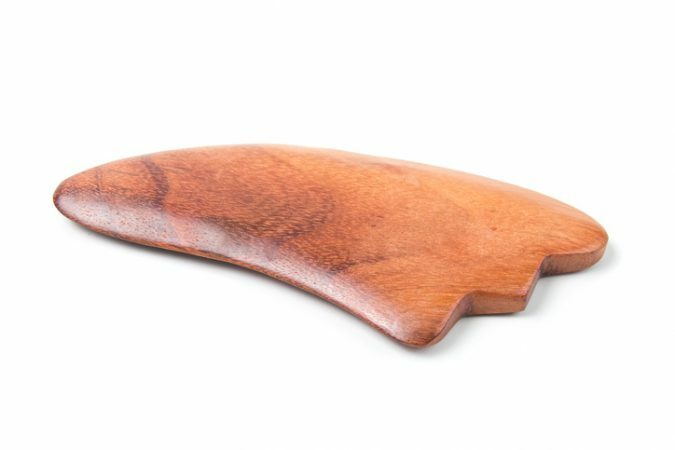 Traditionally, Gua Sha is designed to stimulate and direct the body’s natural energy, or Chi, that some practitioners believe could be responsible for inflammation and other physical ailments. The scraping of the skin is thought to aid in the movement of this energy, while reducing inflammation and promoting healing. 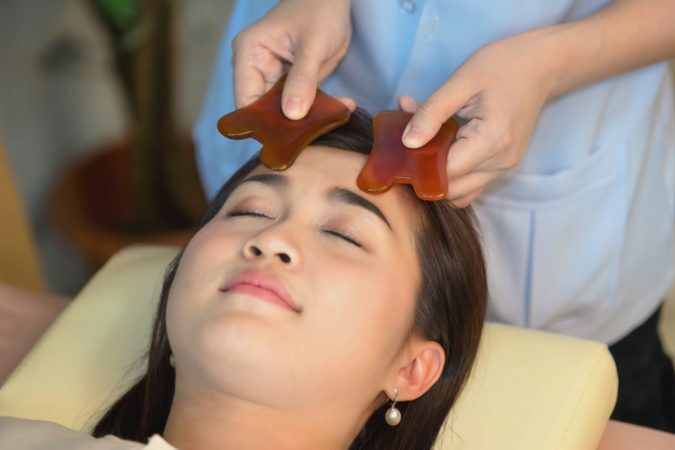 Oil is applied to the skin of the area to be treated, and the Gua Sha stone is then dragged smoothly and firmly over the skin in the direction of lymph nodes. This can be performed on the back, buttocks, neck, arms, and legs, and is now a popular addition to spa facials, substituting the usual facial massage. Some studies also demonstrate Gua Sha benefiting some unexpected conditions, like a decline in liver enzymes in Hepatitis B sufferers, improvement of migraines, a reduction of breast engorgement in breastfeeding women, and a reduction of symptoms of perimenopause. Start in the centre of the forehead and drain outwards towards lymph nodes. As with body brushing, repeat strokes a few times before moving on the opposite side, then moving down the face. Keep the angle of the stone low at around 15 degrees. Perform strokes on the neck last, and bring them all the way to the back to give your client a firm but soothing neck massage. 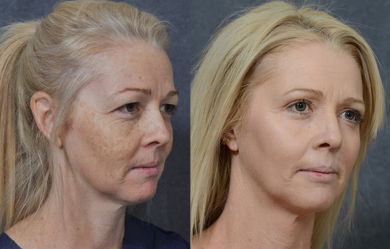 Use light pressure when performing facial Gua Sha, particularly around the eye and lip area. Firmer pressure can be applied when massaging (often quite tense) Masseters. Press the heart-shaped section of your Gua Sha between clients’ brows and hold for 5 seconds. The shape fits perfectly around the bridge of the nose all does wonders for soothing headaches and tension. The same applies to over the brow bone. Be sure to gently drain away under eye puffiness and fluid retention with the narrow end of your stone. Tell your client to breathe slowly and deeply, providing oxygen to the fresh blood flow you’ve just brought to the area, for maximum brightness and healing. 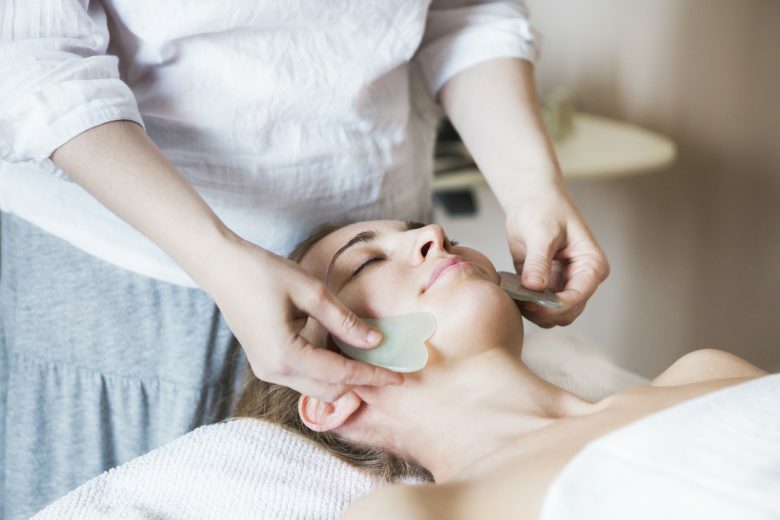 As with every facial tool, ensure you’re washing your Gua Sha properly between clients – this will depend on the type of stone or material, but generally warm soapy water will do.